For Apple Watch users, the third time is the charm. Those issues in watchOS 1 and 2 didn't stop Apple from becoming second only to Rolex in worldwide sales (which Apple CEO Tim Cook was only too happy to note during Apple's Sept. 7th launch event). But watchOS 3 should make current users much happier -- there are noticeable across-the-board speed improvements, new fitness profiles, a new SOS emergency notification and response system, and a revised interface that feels more aligned with what's found on Apple's other devices. In particular, watchOS 3 has more emphasis on fitness and activities, something Cook and others repeatedly highlighted at the event. That, and numerous other changes, should have been in place from the start. That said, watchOS 3 is so improved over versions 1 and 2 that it finally makes the Watch feel like a coherent part of the Apple family. To install the new operating system, you open the Watch app found on the iPhone (which must be running iOS 10). Tap General > Software Update and then follow the on-screen prompts. (For the update to begin, the Watch needs to be near the iPhone, have over 50% battery life and be connected to its charger.) The new OS will download and then transfer to the Watch, which will update itself. Once your Watch restarts and the update is done, you're ready to explore. In watchOS 3, everything feels smoother and more responsive. Apps and data load faster and poorly thought-out interface decisions have been rethought. Three parts of the new interface stand out. The Favorites side button is now a Dock button (more about this later); instead of showing a ring of Contacts, it displays your ten favorite and recent apps, all of them already running in memory for faster access. The old Glances feature has been eliminated, its functionality replaced by live previews of the apps in the Dock. The Control Center, working in concert with the new Dock, is accessed by swiping from the bottom of the screen -- just as on the iPhone or iPad -- effectively mimicking the way you access information on other Apple devices. Let's examine those features -- and others -- in more detail. There are only two physical buttons on the Watch: The Digital Crown, which remains functionally the same, and the former Favorites button that now calls up the Dock. The new Dock in watchOS 3 functions like the Dock in macOS or iOS -- it's a repository for frequently accessed apps. Your favorite apps are added by using the redesigned Watch app found on the iPhone (under the Dock section). The apps stored in the Dock sit active in memory, so it's a good idea to choose only those apps you're likely to access often. Apps residing in the Dock display more up-to-date information than before. How does switching the button's functionality work in real life? Every user's needs will vary, but for me, I've used this button more since installing watchOS 3 than I did during the year-plus of running watchOS 1 and 2. As a matter of fact, before watchOS 3, I thought the extra button redundant and useless. But as a way to access the Dock for quick app launches and glanceable data, the side button works really well. In short: Changing the function of that button has literally given it a reason to exist. But calling up the Dock isn't the only function for the side button. Holding it down for three seconds brings up a list of options: Power Off, Medical ID and Emergency SOS. Medical ID displays your stats for emergency services, including name, birthday, weight, height, blood type and whether you're an organ donor. But it's Emergency SOS that I want to highlight; this is a feature that will help save lives. 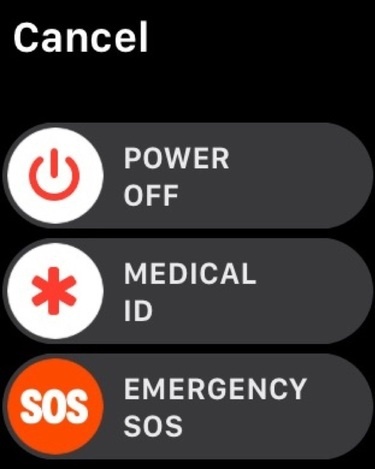 SOS can be activated by either holding the Watch's side button for three seconds and then swiping the Emergency SOS option, or by keeping the side button pressed for six seconds. After the initial three seconds, the display will initiate a three-second countdown; at that point, Emergency SOS contacts emergency services, either through a cellular connection via an iPhone or, if connected to a known network, the Watch will reach out over Wi-Fi. Emergency SOS contacts emergency services, either through the iPhone's cellular connection or over Wi-Fi. Over the past year and a half on the market, there have been several reports of heart attack survivors seeking treatment sooner because of the Apple Watch; I expect this feature to help save many more. With the advances in watchOS 3, apps in the Dock load faster (in many cases, instantly) and they refresh in the background more often -- replacing the need for Glances. What about apps that haven't yet been rewritten to take advantage of watchOS 3? Well, in testing, that depends on the app. Some are better than others. Apple claims a sevenfold increase in launch speed for the apps residing in the Dock. This is a stark change from the launch times seen with the very first watchOS -- some apps were so slow that the display would time out and turn itself off before the app actually launched. Those kinds of issues in watchOS 1 and 2 had me convinced that the Watch was in desperate need of a hardware upgrade before being really useful; watchOS 3 makes me eat my words by breathing new life into a formerly sluggish app experience. All of the apps I've tried launched within 10 seconds, most within just four or five seconds. Those aren't particularly fast compared to SSD-based laptops or the iPhone and iPad, but they're fast enough that you're less likely to be pulling the phone out of your pocket because the watch is too slow. WatchOS 3 adds new faces to choose from, including variations of Minnie (and Mickey) Mouse, Activity Rings (for fitness trackers) and a minimal style called Numerals. Swiping between Watch faces is also easier -- instead of having to press firmly on the watch display before you swipe between faces, all you have to do is swipe. Apple removed a step. As already noted, another change to the Watch face is the elimination of the Glances feature. (Glances were a quick way to view an app's data, like weather or flight info.) Swiping up from the bottom of the watch face now shows the Control Center, just as it does on every other Apple mobile device. There are a wide variety of new faces to choose from via the Watch app on your iPhone. The Control Center gives quick access to several system functions, including the battery life indicator, Airplane mode, silent mode, Do Not Disturb mode, device lock, AirPlay selection, and a button to trigger an audible alert on the iPhone. This last is helpful if you've misplaced your iPhone within range of the watch. Tapping on the battery life indicator also brings up the option to enable Power Reserve mode. Yet another change to the Watch face screen involves Complications, the little tidbits of info you can turn on and off in different watch faces. In earlier versions of watchOS, Complications weren't always refreshed with the most recent data, so if you were checking to see, for instance, the current temperature, the info might not be accurate -- not exactly helpful for a device that should present accurate data at a glance. Because apps are now better at refreshing data in the background, Complications -- and apps in the Dock -- will more likely reflect current information. Note: Because of the way apps update, it's possible you'll catch a Complication as it's gathering the latest data -- I've seen that happen with weather information, which showed the temperature change while I was watching. 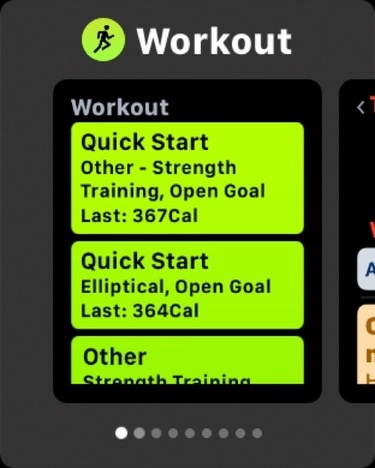 The Watch app on the iPhone gets a significant upgrade, with new options to assign Emergency SOS contacts (under General); toggle on/off background refresh for Watch apps (also under General); and configure how metrics are displayed on a per-workout basis (under the Workout View setting). There are also numerous changes in the Face Gallery tab. There are now rows upon rows of variations in Watch face categories, designed to illustrate the various options available to Watch users. It's an easy way to take one of the Faces Apple provides and then customize it. Being able to see all of the variations makes choosing a Watch face feel less overwhelming. 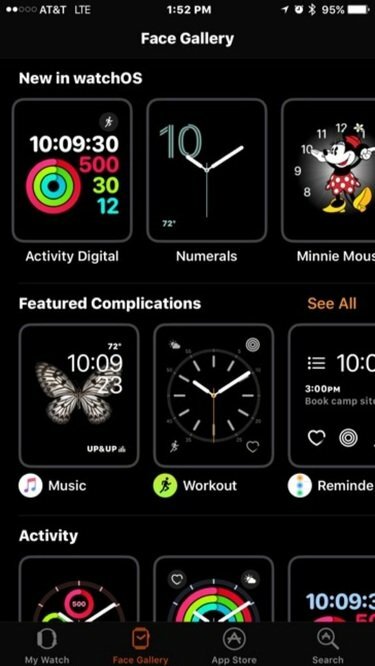 And if you're a fan of the Mickey and Minnie watch face, there is now a toggle under Sounds & Haptics that lets Mickey or Minnie announce the time when tapped. It's cute.